The Kissed By a Dolphin program offers guests the chance to meet one of our Atlantic bottlenose dolphins (Tursiops truncatus), while kneeling on a floating platform. Guests will receive a kiss from a dolphin and a digital photo. Stop by Dolphins Plus to complete your bucket list! I cant say enough about this place!! We had such a wonderful time here! 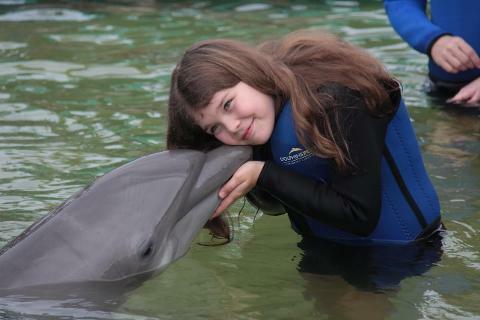 There are many options of things to do here but we chose to kiss the dolphins! Wonderful experience!!! Before you do any encounters they give you a excellent presentation about the dolphins ( we learnt a lot ) and then they give safety information! The staff is wonderful!!! They truly love the animals and make sure that you are also enjoying your encounter!